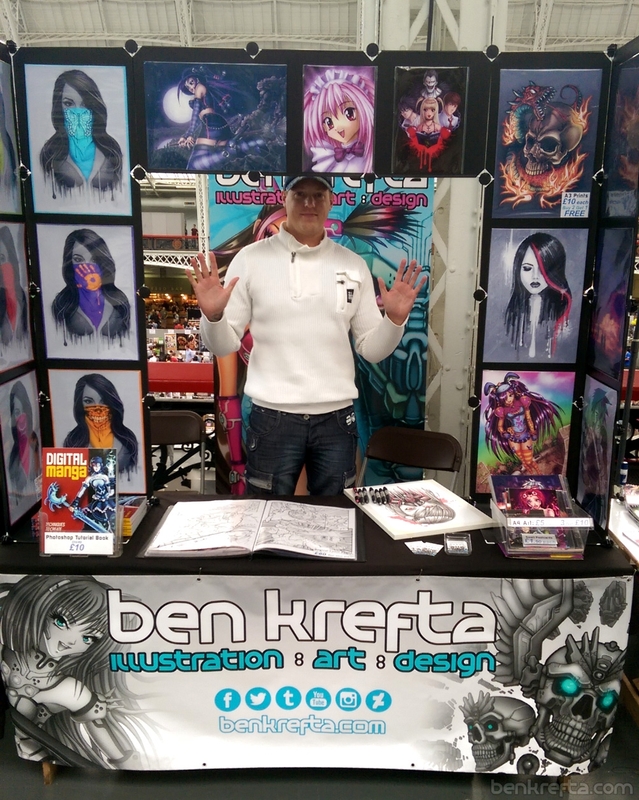 In this article I'm going to be sharing my insights and give advice to artists looking to exhibit or sell their work at comic cons or similar events. I attended 10 different U.K. cons over a 10 month period from October 2015 - July 2016. My aim was to find out if comic conventions are worth investing in and if can I find success at these types of events based on the kind of artwork I produce. Will you make millions from selling art and comic cons? Or will it turn out to be a fruitless venture, not worth the time of day? I can't speak for everyone, but I will be honest about my experience and what I think it takes to succeed. First I'm going to just summarise a few answers to some key questions and will be talking about these things in a little more depth over the course of the article. Overall is it worth an artist selling work at a comic con? Possibly. It depends what you want to achieve from the comic con experience- whether that's to make contacts, try something new, or make a profit. What should I sell at a comic con? As an artist, you're there to sell your art. You can transfer that onto products and merchandise like t-shirts and stickers. But your main emphasis is artwork and the best way to sell that is as prints or take on commissions. Or of course, if you've produced a comic or manga, that's what you're there to sell. How do I book a table for an event? First find out about the events taking place across the country. Google for answers and try www.comicconventions.co.uk for a decent list of upcoming UK cons. Each con should have it's own website- visit those for booking instructions or email the organisers for details on how to book. To start off with- try going for the most local convention you can find to save travel expenses and test the waters as cheaply as possible. Some cons offer an Artist's Alley, Comic Village or Small press tables at a reduced price- so they're usually worth looking at. For example, they might be £70 for an artist's table instead of £300 for a regular dealer table. You're given a table- how you display your products on that table is up to you. Be aware that you're often limited to a 6x2 foot surface area. Other than your products, the bare minimum you'll want is a table cloth or sheet to cover the table, and business cards of leaflets listing contact details or websites showcasing your stuff online. Buying food and drink at these events is always expensive, so maybe bring your own. What's it like at a convention? Day to day you'll be stood or sat behind a table, usually next to other artists or retailers who have their own table. Lots of people will pass by your table, check out what you're selling and perhaps a few of those will stop and want to buy something. Be prepared for both busy periods as well as many quiet periods. Cons typically last 1-3 days and are tiring! So try to rest as much as possible before, in-between and after the con is over. Use the opportunity to check out other people's stuff and have a look around. I love looking at all the cool geek stuff going on at these events. Overall, did you make a profit? While I did make small profits at some of the conventions I attended, overall the answer to that question is, No. Which I was surprised at. But I'm aware of the reasons for this, which I'll explain later on and there are things that can be done to greatly increase the chances of financial success, which I'll also talk about in detail later. Lastly, even though you didn't make a profit, can I make a lot of money at conventions? Yes you can, but it seems more likely that you won't. I'd estimate that 1 in 5 artists at cons make hundreds or thousands of pounds profit from a 2 or 3 day event. The majority of artists I've seen either make a small profit, break even, or make a small loss, and then there's a fairly large amount of artists who walk away from a con having lost a fairly large chunk of cash after all their efforts. I don't want to be discouraging, but I do want to make sure people have realistic expectations of these kinda of events before making the decision to try one out themselves. And even though I'm in the same boat as the majority who struggle to make it financially worthwhile, it definitely wasn't all for nothing. I learned a ton from my experiences and I've got a lot to say which I hope people find useful. Now, I want to go into a little more depth about my personal experience, thoughts and hopefully be able to offer up some advice along the way. I'll be discussing things like my reasons for attending, planning considerations, table set up, what you should and shouldn't sell. I'll provide a break down of costs and sales figures, show how much money I made, what I sold, what to expect and more. So, why did I try the convention scene? There was concern over the financial risk and what if it doesn't pay off? So finally deciding to attend was a pretty big deal for me and turned out to be a great experience in many way. For example, I can't even imagine feeling socially anxious to attend further conventions now! Be out there. Get known. Increase awareness. Potentially make contacts. Sample what it is like to attend an Artists Alley / to sell work. Also it's a day out of the office, an experience, and time away from way from the screen having fun. So it wasn't all about making mega bucks- especially at first. Although the financial aspects were always on my mind. At the end of the day, you're there selling work and you've got a quantity of items you'd like shift. Firstly, Do Research and ask other artists who have been there already about their experiences. 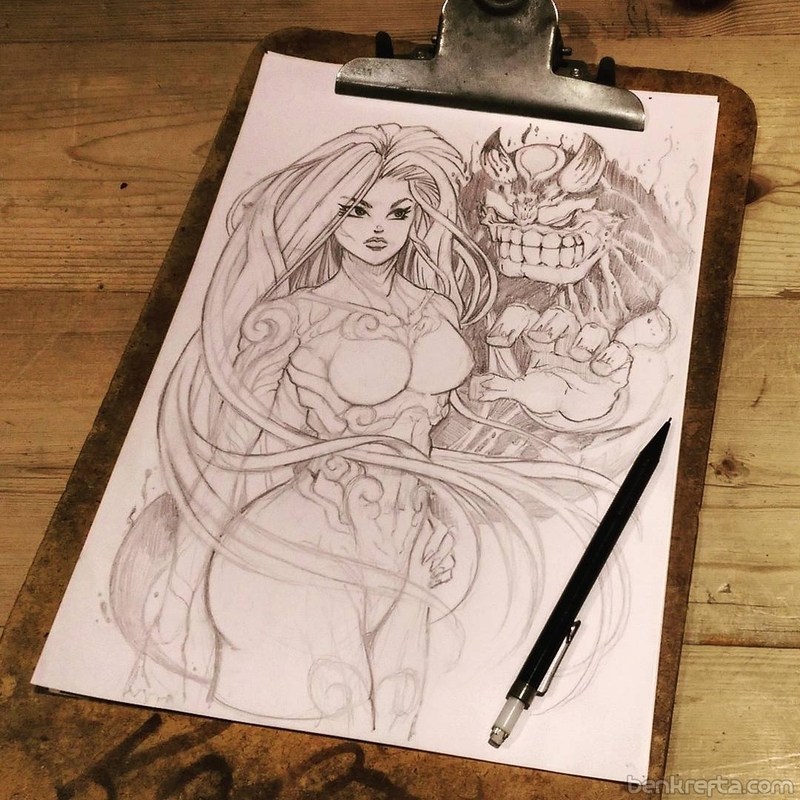 Before I booked a table, I visited a comic con in London and spent some time going table-to-table asking for advice- I got some really great insights by some amazing artists and I really appreciate that. Initial booking- As I mentioned earlier- find out how individual cons work: get added to their mailing lists or check social media feeds to find out how or when to book. For UK cons, try Googling 'MCM', 'London Super Comic Con', 'Showmasters Film and Comic Con' for some of the bigger events. As I mentioned earlier, Small press and Artists tables can often be had at a reduced rate, although occasionally this can mean being situated in a less desirable part of the convention hall. Until you've sampled a con- you won't know for sure what the table layouts will be like. And be quick when booking tables. You need to get in there as early as possible to reserve or secure table space. 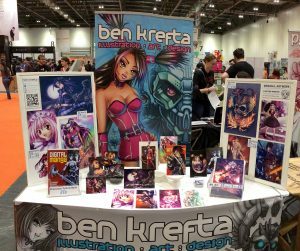 Recently I missed out on getting a 'Comic Village' table at MCM Comic Expo London- which is the biggest UK comic event. Apparently 200 tables got booked within 5 minutes of announcing the call for bookings. Crazy! I got my booking in within 40 minutes and to be honest, I don't think I could have made that any quicker, due to the fact I've got other things going on in my life and generally I don't want to be checking my email every 5 minutes every day to see if tables are now available. Once you have confirmed table booking. You might need to supply a description of your work or image for the cons website or guide book. To be honest, unless you're a high-profile exhibitor, I imagine 99% of people won't care what your picture looks like or what your description says, even if they come across it, and it won't impact on sales. Use Google maps to see how long it'll take and find directions. Consider Travel options- train, car, walking if possible. Give yourself enough time. Remember you'll be carrying a lot of stuff so how will you transport that? Will you need Accommodation? For me, I can drive into a London event each day. It'll take 1-2 hours each way. If I'm headed further north, I'll book a hotel or guest house for 1-2 nights. The sooner you book accommodation, the more chance you'll have getting something nearer to the event and at a more reasonable price. Hotels near venues and on event days get booked out pretty quick. Consider Parking. Parking at venues, for example, the Olympia in London can cost at least £30 a day, Friday, Saturday and Sunday. I use Justpark.com to rent a space within 20 minute walking distance for far less than that, and check if nearby roads offer free parking at certain times. Many of the roads near the Olympia are free to park on Sundays. Is it worth bringing a friend to help? They can provide moral support, company, man the table while you get food, take a toilet break or allow you to take turns looking around the event and might help split costs? Sometimes you'll need to pay for an extra exhibitor pass to bring someone else along. At the MCM events they only give Comic Village exhibitors a single chair, so maybe bring along an extra camping chair or expect one of you to be standing. What makes a good table display? Most tables are dark looking, with a dark table cloth. I wanted mine to be white, and clean like a gallery. I added a branded canvas banner at the front and roll-up display stand at the back to help grab attention and look more professional. Rather than lay everything down flat, I wanted things vertically positioned so that they could be seen from a distance. Added price tags, even considering the font face for the labels to make things clean and uniform. The boards were custom made by painting a couple of old cork boards white and adding an arm to the back to allow them to stand- also making them easy to put up and take down. The boards were angled at around 45 degrees to make them visible to anyone who passed by, no matter where they were standing. Offered a variety of different sized and priced prints- small postcards for a couple of pounds and larger A3 poster sized prints for people with a little more money to spend. Overall fairly neat and tidy. Trying not to create too much of a barrier between myself and customers by boxing myself in with too many display panels above and around the table. Making back my initial outlay on a table display was unknown entity, so I chose to play it safe and work with a tight budget, and see how things went. What are other's tables like? Often people use interlocking wire mesh cube panels as display boards for their work. I ended up trying this out for the last con I attended. It looks solid, professional, and again, I'd got several compliments on how it looks. Although I admit it takes a lot longer to set up- maybe 45 minutes to an hour? Some artists just have a couple of products and don't opt for much in the way of displays. Whatever you decide, I'd advise a test run at home- dress your table up in advance and lay it out to see how it looks before bringing it to a con. Maybe when you get it how you want it, take a photo for reference on the day. Is a decent display the most important thing? No. Can it help? Yes. I've seen tables with just 2 or 3 different comics laid out flat which seem to generate far more interest than the more colourful, eye catching tables. If I'm honest, it felt a bit frustrating to have considered my set-up so much and to feel like I got it right, while my neighbouring table was completely bland and empty, yet was generating far more interest. Perhaps my display wasn't as effective as I thought? Or more likely people simply weren't resonating with my work. It at least highlighted to me just how important is it to be selling the right product compared to how you display it. Why did I price and label things? 1- if a seller is busy with another customer I don't want to stand around waiting to find out a price. 2. It creates too much awkwardness if a price is out of my budget. Be prepared to lower or raise prices so prepare additional labels. I expected that mentioning if a print is a high quality Giclee or on thick 300 gram per square meter card stock was an added selling point. In a gallery setting or online, this may be true. Although to be honest it don't think anyone really cared about the finer point of paper or ink quality at the conventions, so long as they liked the artwork. What did I bring to sell? 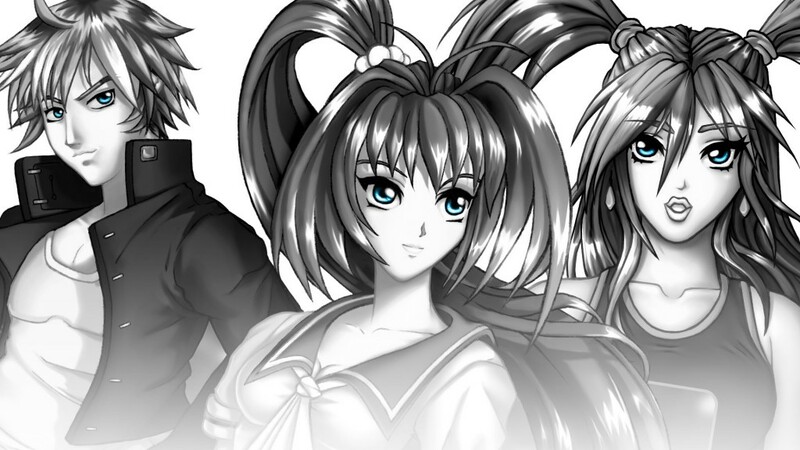 Mainly prints of my original manga style art. Over the years I've mostly I created bright, colourful and digitally glossy character art. See below for some examples. Plus I was selling one of my recent published books- 'Digital Manga', a tutorial book teaching Photoshop and digital art techniques at £10 a copy. It's worth noting that at the MCM cons, you're specifically instructed not to sell fan art if you've booked a reduced rate Comic Village table. Original Art and comics only! I will still see some people selling the odd fan art or draw fan art commissions on the day. I don't have a massive problem with that, although most artists I've spoke seem to frown upon it, as it gives certain people an unfair selling advantage. I've since learned that my style and theme of original artwork wasn't necessarily the best thing to bring to a comic convention. And I'll explain about what I did right and what I did wrong later. So, what Should you sell? Probably prints and/or a comic or art book. Look at your portfolio and short list your favourite images. Maybe get a second opinion. For your first show, bring along a range of images- it all needs to be geek based; sci-fi or fantasy themed and if you draw both portraits and landscapes, bring both and see what sells. As a general rule, demonstrate a consistent style. This is one thing I seriously lacked and regret in my own work. I love playing around with different styles and ideas, which is all good and well, but when you want to sell a product or brand, in this case, you and your selection of artwork, a consistent style and theme is really important. 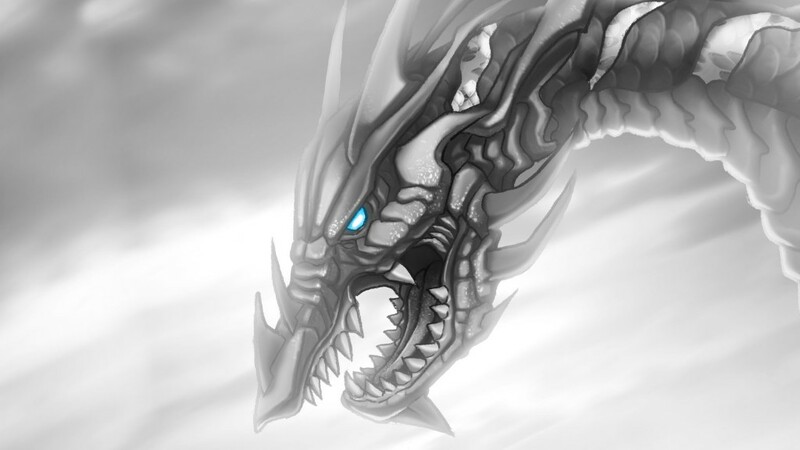 It's something I will definitely be working on for future events. Fan art is important. Although I've not tested my theory, but I'd suspect a good piece of fan art can outsell originals 10-1! Most people at these events are fans, looking to engage with their passion and interests. If you show them their favourite character or a series they love and have an affinity with, they'll be extremely tempted to part with their cash. There's fan art all over the place, so consider being original- executing your style or adding some unique element to the fan art. I've traditionally concentrated on producing originals. That's what I value, what I'm mostly interested in, and what I'd personally buy from other artists. I find it somewhat immoral to effectively piggy-back off of another artist's creation, solely to cash-in and make money. Doing so makes me feel like a sell-out, willing to throw out my artistic integrity (Having said that, I don't have a problem with being a genuine fan and wanting to create fan art as a celebration of another's idea). However, I've now discovered that kind of thinking won't shift high volume and you need to sell a lot in order to make these things financially worth your while. I've talked with several artists who tell me their best sellers are always the fan art pieces and rarely their originals. And I noticed first-hand how, for example, one top-end fan artist sold 8 prints in 5 minutes, making £90 while I happened to be passing by. Whereas I've sometimes not even made £90 during the entire day! Of course I'm comparing myself with a fan artist who had triple the table and display space I had, was in a far better location within the venue and producing consistent, high-quality work. There is a market for original products if the quality and consistency is there. If you have a following already, you don't necessarily need to go down the fan art route. But I feel an unknown artist would be better off introducing people to his or her original work through fan art. - This is something I would like to experiment with. I am curious to see what is possible if I produce a series of high quality, consistent fan arts to sell at a comic con. I feel it's something I'm capable of although it does mean taking time away from the original art I enjoy creating, being left with work I couldn't necessarily sell or use in certain other markets and I'd need to reconcile my artistic principles i.e. To sell out, I must become a sell-out, and that is simply part and parcel of the life many artists face in order to financially survive. Regarding fan art licensing and copyright restriction. It is usually illegal to produce and sell fan art. An original owner or creator of the work in which you're creating a derivation of would have grounds to sue you in this case. In 2014 the UK introduced a new 'parody, caricature and pastiche' law which could apply in the case of fan art, although exactly what constitutes a copyright infringement is still partially unclear. What is also unclear is at what point is a work considered original, derivative or pastiche? In reality, suing a fan artist is extremely rare. Those that hold intellectual property copyright (for example, Marvel, Disney, or Nintendo) wouldn't sue fan artists since they're promoting the fandom around their creations which potentially benefits companies in the long run. For a company to sue a fan making a relatively nominal sum of money from their creations would also generate unwanted bad-press for these companies. Millions of copyright infringed works are being uploaded onto the web and sold or used as a marketing vehicle, or sold in stores every year and this is virtually impossible to police. If a company did want to make an example of those who infringe their IP copyright, they'd likely start with other, larger organisations, groups or companies who are damaging them or negatively effecting their sales and reputation in a much greater way. Think of the prolific Chinese counterfeiters who make millions out these infringements on a daily basis. Original creators would find it very difficult, time consuming and costly to peruse individual fan artists. Everyone is doing it. To the point where it's evidently becoming more and more difficult for a comic or anime style artist to build a following or financially survive without producing or selling fan art. On the subject of fan art, sure- draw popular characters. But don't just re-work someone else's existing artwork. 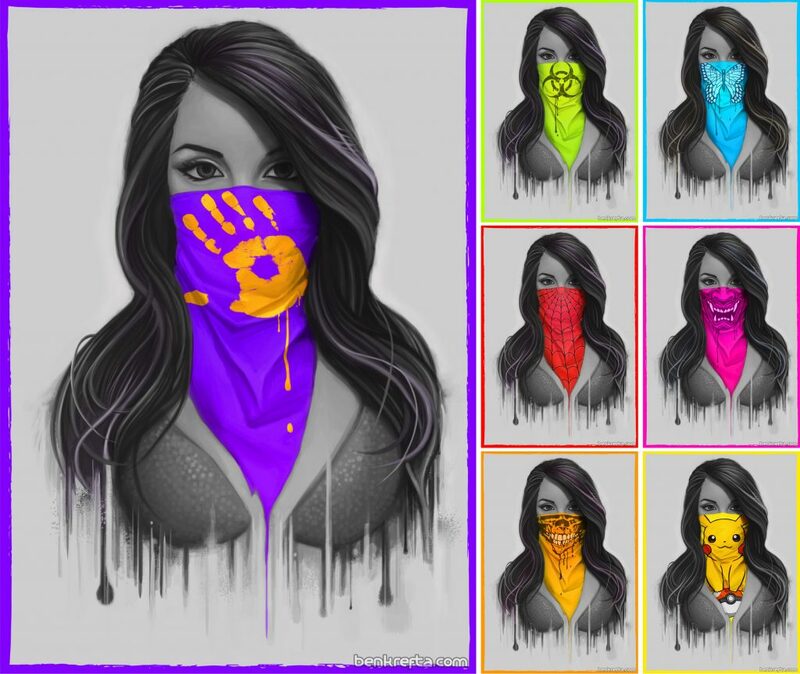 On a few occasional I've chatted with some really friendly, nice "artists" at cons who I'd want to support until I check out what they're selling- an existing image they grabbed off Google which they'd re-painted, or digitally manipulated. 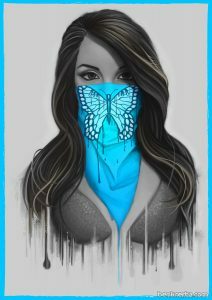 I don't feel a cheap re-hash or rip-off of another artist or designer's work has any place at an event like that. Don't be lazy or sneaky- make something entirely your own. Home Printing or using a print company? I've got a fairly decent A3 desk jet printer, so decided to manage my own print runs. This meant I could try just 5 or 6 copies of any one design, bring them to an event and see if they sold. If I needed more for the next day, I could print more. Using a print company will mean a better quality of print and could be significantly cheaper per print proving you buy in bulk. You'll likely have to get a minimum print run of 50 per design. Since my work was never selling like hot cakes, having a dozen or so designs and 4 or 5 prints of each was sufficient and glad I didn't commit to even 50 of each or I'd likely still be left with 85% of my stock after 10 conventions! I was selling a low, medium and high price selection of prints to cater for different budgets. Although I feel if you have a more mature style of art that will attract an older and wealthier customer, maybe just concentrate on larger, higher priced prints? Like everything, these are just my experiences and observations, so nothing is set in stone and you may need to adjust based on your style of work and specific requirements. I'll be discussing print costs and pricing later on. I've not sold my own, so can't really comment about this in detail. I personally love comics and would love to actualise my own story ideas, but sequential work takes me forever, so have been reluctant to invest my time in creating stories. I have a lot of respect for anyone taking on the task to complete a comic, graphic novel or two. Providing you can get people into your story and immerse themselves in the world you've created, you'll gain a loyal fan for sure. 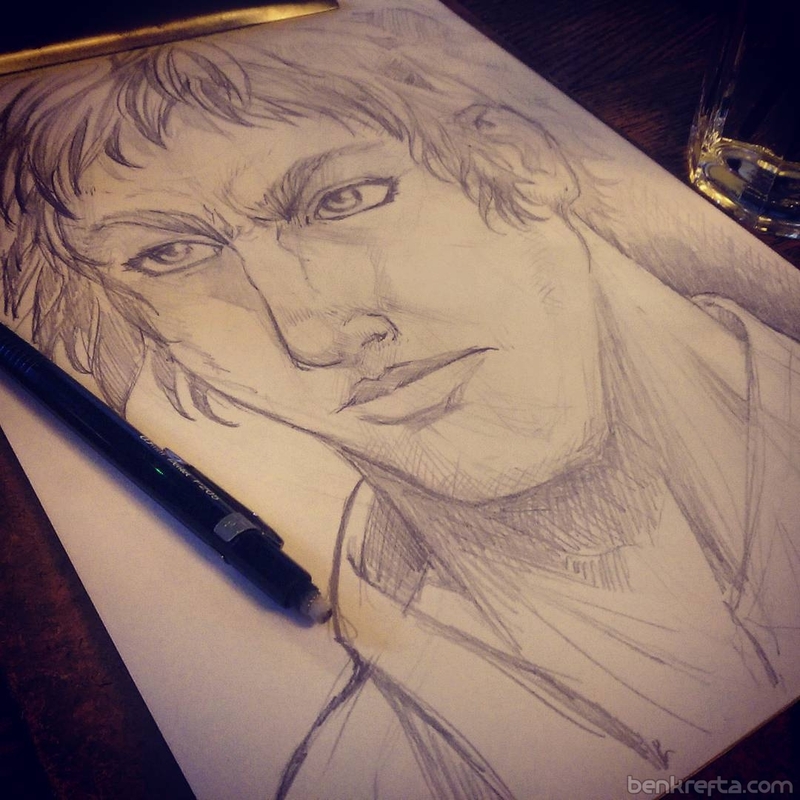 This can be a caricature, manga or comic style portrait or a requested character art. Usual scenario is- a customer will come up to your table, ask what they want and if you're happy to give it a ago, you'll take a deposit or payment up front, then get to work. If you're going to need a few hours drawing each piece, or have several to get though, obviously tell the customer to come back later. Again, this isn't something I've tried. Reason being, I feel that my art is inconsistent and I couldn't guarantee what I'd end up producing. I feel vulnerable to having an off-day where I might not produce the kinda work I'd be pitching. That wouldn't be fair on the customer if I couldn't deliver something that wasn't 100%. Plus I feel uncomfortable being watched as I draw. Several people have asked me about commissions. I say, I'm willing to take them on after the event so that I can devote more time to producing something of higher quality, and offer to post the work directly to the customer, although to be honest, I've never received a genuine commission request following an event. I think most people just want to pick up a customised memento on the day. A lower priced sketch, and not necessarily a work of art. Also something to initially Avoid are things like selling Clothing. Printed t-shirts for example require larger print runs to reduce cost and make a profit, they needs more display space than a single table allows, and the requirement for multiple sizes gets complicated. Items like custom coffee mugs might seem like a good idea, but they have a low profit margin, take up space to store and require a larger production run to get the stock cheap enough to begin with. Stickers and badges? I personally wouldn't bother with them. Or at least not make them your main focus. Sure, they can definitely sell, but you'd need to shift hundreds, if not thousands in order to make any good money from them. I can just imagine most convention artists have 100s or 1000s of these things just lying around in boxes at home which'll end up getting thrown out in years to come. Tickets or printed passes for the event, which should have been emailed to you. Directions or a map to get there or other Paperwork. Keep all that stuff on your phone also as a back-up. Business cards / optional flyers if you have something specific to promote. Overnight bag if staying over. A float and cash box with enough spare change. Credit card facilities aren't necessary, especially for your first event. Con-goers know cash is expected. Having said that, I wouldn't rule it out and have missed out on a sale because I didn't accept card. Bags for prints. Every time a customer buys my work, I always put it in an appropriately sized a clear, plastic sleeve to help give it some protection. Some people prefer to roll up their work with a rubber band, some use bags with handles. A Sharpie or pen to sign your products. Art supplies if you intend on drawing or taking on commissions during the event. Other set up sundries like pins, tape, paper, blu-tack and scissors. A lot of people, myself included use a suitcase to put everything in. On the day, when you arrive at the venue your first goal is to get a wrist band or lanyard exhibitor pass, so that you can then get in and begin setting up. I find this in itself to often be one of the most daunting aspects of the convention scene. You often have large exhibition halls to navigate, little to no sign posting as to where you sign in or set up. Security guards or event staff often have no idea where you should be going either. I always expect a confusing mess and lack of direction, and that's often what I get. Especially with the MCM and Show Masters events- the latter being particularly awful at providing on-the-day guidance and instruction. Once you do get your pitch set up, it gives you a great opportunity to browse the venue before the public arrive and introduce yourself to neighbouring artists or retailers. Most exhibitors I've met at these events have been really nice people, and it definitely helps make the days go quicker when you can have a chat with like minded people about shared interests. The first few times I attended these events it almost felt magical! I was in geek heaven! Although once you've seen a few cons, you've seen them all so feel that novelty starts to wear off after you've been to a few- most vendors make repeat appearances on the comic con circuit, selling the same selection of items every time. 2 day events cover the weekend, although 3 day events are becoming more common, which include a Friday. Friday is always the slowest, less busy day, while most visitors will attend on the Saturday. For me personally, I often debate whether it's worth even attending the Friday since just trying to break even can be a struggle. Sometimes, Sundays can surprise me, with weekend pass holders deliberately not making purchases until the last day. A day will involve quiet periods, even for the more popular sellers. Use these times to tidy up your stock, chat with neighbouring artists, check out other people's stuff or draw, particularly if you've got a list of commissions waiting to be done. I'm often too tired to draw and focus at 100%. Dealing with fatigue is a definite factor for me at these events since they often require I get out of bed at 5 or 6am in order to drive to the venue and set up before the doors open at, say, 9. I'm a night owl so I've normally only had a few hours sleep before hand. Also at the end of a day I'm often 'buzzing' and over stimulated from the day's activity. This makes it hard to sleep the next night, even though you know you've got to be up early the next day to do it all over again. And if you're staying at a local hostel or hotel, the fact you're not in your own bed doesn't help you with sleep. Don't forget to eat and drink during the day to keep your energy levels up! Busy times are great. And I think if you look busy, other people suddenly become interested in your table and start to see value in your work. It's a weird one. * Selling things they shouldn't. For example, selling little more than a novel or novels in the 'artists' alley. At the end of the day. You can leave your stuff at the venue. Most people cover their table with a cloth and or put stock and valuables underneath their table. Before I get to costs and sales figures I'd like to discuss selling. So how much should you sell your work for? I sell mine for £5 each or 3 for £10. I sell mine for £10 each or 3 for £10. - These are usually for unlimited print-runs. Limited editions are often £5-£10 more per print. Sure, if you were selling art in a art gallery a limited A3 print could likely sell for £40-£100 or more. Most con-goers aren't art buyers, are too young to have that kind of disposable cash or, unfortunately, most people just wouldn't value comic style art in the same way. A4 sized originals usually in the form of character drawing or marker coloured art tend to sell for between £20 and £60. However I have seen industry professionals or those with a fan base attempt to sell A4 originals for between £150 and £400. The industry professionals (having worked on a mainstream comic for example) typically charge £200-£300 for an A3+ sized pencilled comic art cover. Commission prices are similar to original art, although £10 for a reasonably quick sketch is common. More often than not, a quick sketch is preferable and within most people's budgets. If you have a fan following, taking commissions before the con is a good idea, giving your fans the opportunity to buy the work directly from you while giving you time to prepare the work beforehand. To up-sell is an good option; so 'buy one get one half price' or 'buy 2 get one free'. Your selection or work will need to be consistent or similar to maximise the opportunity to sell more than a single print. Use round numbers to avoid running out of change and keep things simple. So charge £5 rather than £4.95. Smile, be friendly, welcoming and positive. No need to go over the top. Just saying hi, or invite people to browse can be enough to secure a sale. If people do come over while you're drawing, look up, make eye contact and say "hello", or "feel free to have a browse", or "if you need anything let me know", otherwise people might feel uncomfortable at the thought of disturbing you. Engage with visitors- think of some opener questions like, "Hi ya, so what are you into? ", "How's it going?" or simply- "Nice cosplay!" I like to ask: "Do you have a favourite piece?" or "Anything that caught your eye? ", I feel this gives customers the opportunity to actively find a piece they can identify with and consider in a positive way. Pressuring some people into a sale may work for smaller items although, it may be repelling other visitors. I personally don't like the idea of it, even though I've seen it can get results, to a point. At first I thought it would be a bad idea to have my head down, working on art, but actually, I think it takes the pressure off people to come over and have a look at what you're doing or what you're selling without you, the seller, looking at them and making them feel uncomfortable. If you can market yourself before the con, do. Post on social media accounts- Tumblr, FaceBook, Twitter, Deviant art, Instagram, your own site or blog. Obviously if you don't have a following, this will have limited success, but even if a few friends and family know you're there, they may attend and stop by on the day to say hello. Also, while you're there, record sales. Work out which items are selling, and how much money you make, otherwise you'll have no idea if the event was financially worthwhile. What people seem to buy? So earlier, when I explained what I think you should sell, it was based on these kind of observations. So how much did I spend and how much did I make at the conventions I went to? First I needed to invest some money for my table display and for stock. I'm good at keeping costs to a minimum and tried doing this almost as cheaply as possible to lower risk and maximise profits. So that was pretty much my initial outlay, plus Stock costs. I managed to make sure I never had much surplus stock, so luckily I don't have 1000 unsold prints or books sitting in boxes at home. I can sum up the financial side of things like this- my venture failed. Including the initial £100 outlay, I'm around £680 down. I could afford to lose that amount, but if you're thinking of doing something similar, would you be okay with that? As business ventures go, that's not too bad. To be fair, many businesses can be tens if not hundreds of thousands of pounds in the red for the first few years of trading. Perhaps Cons are a good way for some people to learn a few ropes in the business and retail world before taking on bigger, higher risk ventures? I know how to find a bargain. As well as inexpensive stock in the form of prints and books, I managed to keep my accommodation costs very low- averaging just over £30 per night at some reasonable hotels. The only cheaper alternative would have been shared dorm hostels or sleeping on a friend's couch. Travel costs were sometimes split between myself and a friend. It would be tempting to hide the fact my convention circuit experience wasn't 100% successful. It would probably make me look better and give my words in this article more authority. And I want to be positive and encouraging to artists looking to try the convention scene, although it's more important for me to be balanced, realistic and give an honest account of my experiences, as depressing as that might sometimes be! Hindsight is a great thing. I've learned a lot from my experiences and that's why I'm talking about this stuff- so that no one needs to step into the realm of selling at conventions without being educated about what's involved. My biggest problem was simply not turning a profit. I tried exhibiting my work at 10 different shows across the UK. Some smaller and more local, others in larger cities. I can see how you might perform well in one show, and not so well at another. There are different types of audiences and factors which might help you make money at one event, while failing at another. And while every show differs, it gave me enough data to draw a few conclusions. Earlier I listed what I observed others selling and why. 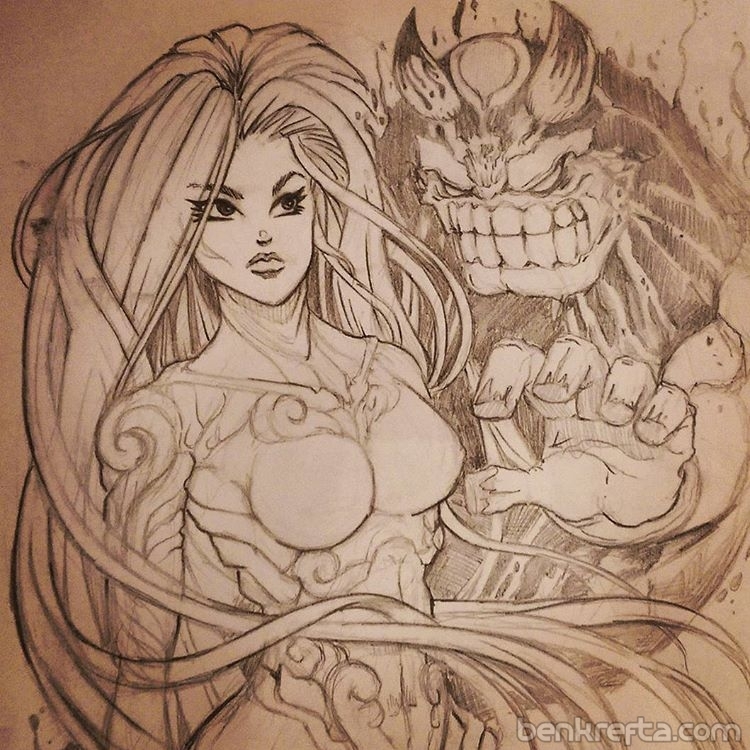 - I didn't have a comic to sell, a significant fan following, fan art or anything clever or thought provoking on show, no unified concept or consistent style, I wasn't taking commissions. 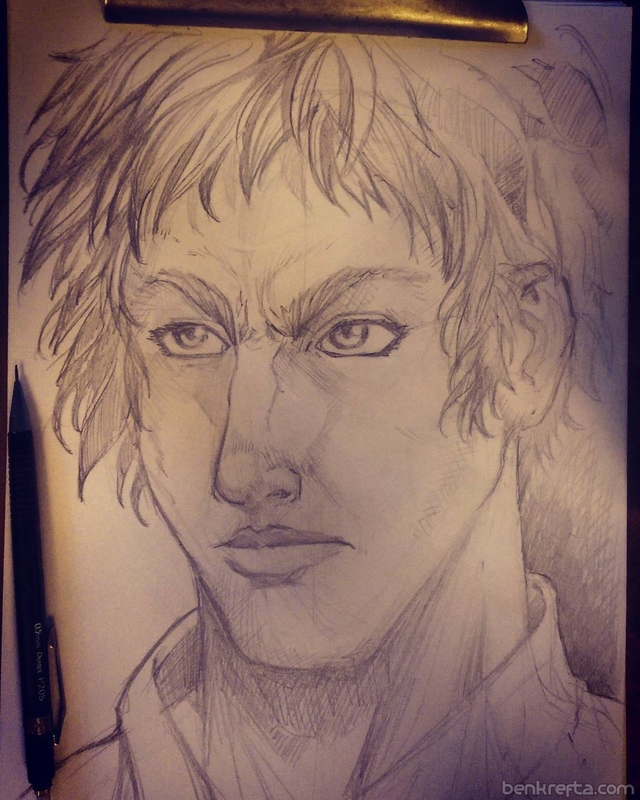 Instead, just offering some of my pre-existing, reasonably decent, original character art which I thought would be sufficient to at least get me started. I'd hear people comment as they walked by the table, giving praise and suggesting they liked it, or coming up to me to tell me how much they loved what I was doing, but obviously not enough to part with their cash. Frustratingly there wasn't time for me to produce a new series of artwork in-between convention bookings. After being 3 or 4 events in, I knew I needed to adjust course, but shows were already booked and I had too much going on at the time to create anything new. I still have limits so far as artistic technical ability is concerned. I can continue to practice my art and increase my ability, but leveling-up is something that takes years of conscious effort. In the mean time I can reconsider the content of my work and produce what people want. In an ideal world I'd be one of these artists who by luck happen to love creating the kinds of art which people want to buy. These types of people can effectively walk into a convention and nail it right off the bat without needing to cater for a market. Whereas, if you're like me and you're work is too niche or if people just can't see the value in your work like you can, then you haven't got a choice but to follow the money and make more effort to get hold of it. I'd be really interested to try some more events and prove my theories correct, but first I'd need to get to work on conceptualising and creating a new range of artworks designed specifically for the con-going market. Money isn't everything, and I knew that going into this endeavour. But if people are willing to buy your art, it does give you a boost. It feels like you're doing something worthwhile, that your work is effective, it's making people happy, it's resonating with others who demonstrate they want to connect with you and your ideas by making a purchase. And when I sell a Digital Manga book, I'm happy knowing it's going to help someone to improve their Photoshop skills and I'm passing on my knowledge. More sales means the more I know I'm connecting with people. Therefore if sales are far and few between, not only do the days drag, but it feels like you're sharing your creative vision, exhibiting the fruits of your labour and putting a piece of yourself out there, and no one cares. That can be tough to deal with, and perhaps somewhat isolating if you see others around you who do seem to be connecting with customers. I spent under £100 for my table display, bags, stuff like business cards. One guy next to me mentioned spending over £100 just on his roller banner, which wasn't even as wide as mine. I could have easily spent £500+ on this initial outlay. Stock and item costs were like £150 over 10 conventions. I could have easily spent way over £500 on this, maybe £1000-£3000+ if I was overly optimistic and had ordered print runs of, say, 1000 for each design I had available. I calculated travel costs to the penny, where I bought stock and how much I paid, how many items I sold, which items sold and on what days. It's easy to find out how much cash is in the pot by the end of the event, but I imagine I'm one of only a few people who can tell you exactly how much profit I made- to the penny. Given that I was sticking to a tight budget and working with the products I had to sell, I didn't feel there was much else I could do to improve my set up, other than what I tried on my 10th convention, which was to increase my display area using the black interlocking squares. What I had wasn't perfect, but it was easy to fit in a suitcase, roll out and set up. I'd definitely like to improve my display area and would be willing to spend more if it helped showcase the work and increase sales, but that easily takes second place to getting the product right. I got to test the waters using artwork I'd previously created without needing to invest time to produce a product for the events beforehand. This at least gave me a overall feel for the convention scene. Who knows, I may have otherwise done poorly in one event, then gave up without trying another which would have turned out to be a success. And most events were local to me and within an hour or two's driving distance. If anything I learned what didn't work- both by observing my own mistakes as well as other peoples. I learned that there seems to be a formula or framework to success. We can all be decent artists producing decent work, but the message you communicate and how effectively you get it across to your target audience and while within the kinda big, busy convention environment is vital. And generally I think you can apply the things you learn at events to other aspects of your life or artistic endeavours. One convention I attended was just bad! No one was selling particularly well. The guy next to me took a £300+ loss and the best feedback I'd get from asking around was "at least I made back the cost of the table"! Another two conventions saw me and a few other artists shoved out the way of the main venue hall. The footfall was around 10 times less than if situated within the main part of the show. Overall, due to such poor sales, I didn't get sufficient data to conclude what my best seller was. I sold a little bit of everything, be it a cute anime girl, a macho cyborg warrior or a tattoo inspired skull illustration. So why are there so many artists desperate to sell at conventions if most artists will in fact struggle to make money? I've spoken with dozens of artists at these events (mainly original art / comic sellers) and it seemed like a lot of people didn't want to admit how much they were financially struggling. I would have loved an honest discussion about the financial factor, but nearly everyone was trying to project a positive, successful vibe. I don't know exactly how much other people were making, but I found it hard to believe that artists felt it was acceptable to break even or earn, say just £100-£200 net profit after devoting 2 or 3 days of their time. Plus however many hours of art-working and preparation time before each event. Some guys told me they make their living from these conventions. I find that hard to believe also. How is that possible unless you're consistently bringing in one or two thousand pounds worth of sales from each event to offset travel costs, lodgings and expenses? For the majority of artists I didn't see that kind of money exchanging hands while I attempted to keep tabs of transactions taking place within the same isle as me. I'm sure some artists simply enjoy taking part. I know my initial motivations weren't based around earnings, although money did become a bigger factor, the more I attended. I read an American Comic Con report from Kiriska.com which listed average sales at over $1,200, (about £950 at the current exchange rate) with highest earnings at $11,000. I've even heard rumours elsewhere of artists making $20-30,000 at a show! I don't have a UK report to compare against, but if I were to guess, UK gross revenues wouldn't even be half that. I remember two people I chatted to both reported their most profitable events had earned them £800 gross (not net profit). Although making half that amount seems more common. After deducting expenses, it really isn't much money at all. I guess, if you self-publish a comic, or draw this kinda comic or manga art there aren't many offline outlets to exhibit at. It seems to make sense for artists flock to conventions in an attempt to get their work out there if there aren't alternatives. Although in practice I wonder just how many artists pour more money in to a convention than they make back? From a social stand-point, it's cool after you start seeing the same people at events. There's somewhat of a community in an artist's alley and it gives an opportunity to chat with like-minded people and make friends with some awesome artists. Admittedly I felt like some of the regulars were a bit cliquey with each other and I guess that's to be expected. I think artists in general are creative people who want to focus on their own projects, so are often too engaged with their ideas to consider enquiring about yours. So an opportunity to not only work towards the project of exhibiting at an event, but socialising and being out there is a big driving factor for many. There's potential to sell well at a con, but can take a serious time, effort and trial and error, to get to that point. An alternative for artists might be an online Kick-starter campaign or Pateron account to fund their creative ventures. I've not tried these, but those who have tell me they often involve a huge amount of hard work to get a project funded or to be able to live off of monthly Patreon earnings. Most of us love the thought of sharing our ideas and vision with the world and getting paid to do so but it's evident that only a very small percentage of artists get given that opportunity. I wish I wasn't saying this! It's kinda sad and I wish there was enough money to go around so that creatives could do their thing without money worries. Many artists I know produce something worth sharing and paying for and the challenge artists face is being able to find their market and the types of people who appreciate their work and who want to support them. Meanwhile co-existing with a million other competing creatives. So, conventions- Give me credit for giving it a good go and trying to make something happen. It does take time, effort and energy to put yourself out there and I have respect for anyone who goes through that process. And I want to say a huge thank you to everyone who stopped by at my table to check out my work and I really appreciate every individual who made a purchase. It really means a lot to me. For anyone else, I'd say to also give it a go! You never know what will happen until you try these things, but it's worth being realistic and open to the fact you could lose money and waste time at an event unless you do it for the right reasons, you get it right, and are offering what people want. I'd love to hear about other people's experiences attending comic cons or similar events. I've tried to think of everything I can so far as conventions go, but I'm sure I've missed something so if you have any other questions, feel free to leave a comment and I'll do my best to answer them. I know this was a long one, so thanks for reading! I'd been wanting to create a new series of girl face artworks featuring a monochrome+single accent colour palettes- these are the results. Please with out they turned out. Not sure about the Pikachu one though, but perhaps still an idea worth testing? They gave me an excuse to use Photoshop a little differently that I usually do- to effectively paint digitally using a variety or brushes rather than produce my more typical digital airbrush colour effects with a generic low-flow round brush. See below for 'Hand print', 'Spidey', 'Hannya', 'Skull', 'Biohazard' and 'Butterfly'.